The Mobile Garden Center is a community green space on wheels for food production, education, creativity, and neighborhood engagement. It is a part of House Life Project (HLP), which is a community of artists and local residents who use abandoned houses to create art inspired by the neighborhood. We are currently located in the Saint Clair Place neighborhood on the Near Eastside of Indianapolis. Because of the partnership with the City’s land bank, there’s always the chance that we will have to move. (Hence, the Mobile Garden Center). One focus of HLP is to explore the realities of both mobility and vacancy within a neighborhood and, with that in mind, take on the challenge of making mobile and accessible the activities that would be deemed impossible in certain areas. Inspired by this idea, the Mobile Garden Center also explores these topics as well as the broader issue of food insecurity. 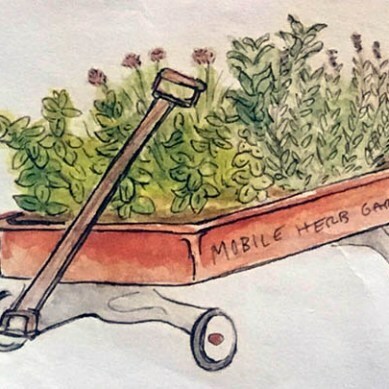 The Mobile Garden Center consists of three mobile garden beds with attachable hoop houses, a wash station, a rain barrel, and a three-bin compost cart, all of which are portable in some fashion. Areas of focus: building healthy communities, beautification of the neighborhood, nutrition education, access to fresh & healthy food, and improvements to mental and physical health. Neighbors young and old learn how to grow food from start to finish. We explore flavors and varieties of foods and discover new favorite snacks. The Mobile Garden Center, and the activities associated with it, take place outside, which helps keep us engaged outdoors. This project creates a shared space where anyone can participate in improving their neighborhood. The older generations impart wisdom to the younger generations, and neighbors who have never met form friendships while pruning tomatoes. This project brings people together, connecting them through food and the shared necessity of it. It provides space and context to talk about culture and history through the lens of food, as well as opportunities to connect and work with people from various walks of life.